Storytelling has long been a staple of good brand marketing. But the concept has taken on more urgency in the digital space, where brands now have the power to engage directly with their customers through web and mobile channels. 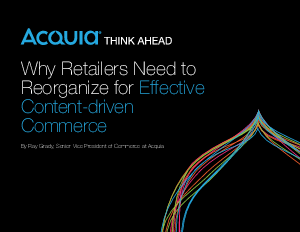 The mandate for more sophisticated brand content has introduced a new set of challenges for online retailers—namely, how to integrate traditionally separate marketing and commerce operations to deliver a unified experience to shoppers.